Ancient Mayas once occupied the riversides of Stann Creek District (a prime area). It also served as a haven for pirates. Eventually other groups arrived to settle along the coast and inland, including Mennonites, who brought farming techniques to the island. Part of the Maya Mountains gives Stann Creek District a sturdy backdrop to the several Mayan and Garifuna houses in the villages and along the coast. Most groups are devoted to agriculture, and the rest to subsistence fishing. As some of the poorest communities in the country, their livelihood is a primary concern for the local government. Yet they are not properly heard or represented during council meetings. Individual farmers still rely on themselves and turn to cash cropping of cocoa, seasonal fruits, and citrus to earn. Some try to maintain business with private buyers from the other districts. Others engage in craft-making. A large part of Stann Creek District is preserved to protect jaguars and the site is known as Cockscomb Jaguar Reserve. Small shores are also left untouched. But with the improvement of the main roads and the construction of smaller ones, access to shorelines which have residential tourism potential is made much easier. There are already private gated communities sprouting on the region, with Chabil Mar the most luxurious, which only highlights the great divide between wealth and poverty in the district. Placencia on the other hand is an example of how a simple tourism project on a fishing village can get out of hand. Placencia is Stann Creek District’s tourism centre. Hotels, resorts, dive shops, bars, and restaurants line its coasts and both sides of the main street, which is a narrow strip of paved walkway. Visitors primarily come here to fish, scuba dive and snorkel. Local tour guides are available, and fishermen take visitors on fishing trips. Placencia is fast becoming a top fly-fishing spot. The beaches are nice but not exactly breathtaking. Creoles are the main residents of the village. Their brightly-coloured clapboard houses with thatched roofs are still a charming sight to behold. Recent additions are homes with concrete walls. The Mennonites, who also comprise a big part of the population, usually keep to their agricultural ways and traditional mode of transporting produce. 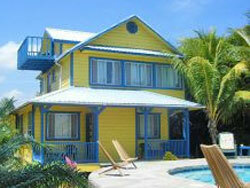 The average hotels in Placencia are not very big, consisting only of about 20 rooms. But recently larger constructions have risen. Coco Plum Community consists of waterfront lots, condominiums, villas, a recreation centre, swimming pools, and a harbour. Most investors are North Americans, Canadians, and Europeans. If more planned construction is approved, including a large resort with marina, Placencia will have a critical problem with garbage and waste water disposal. The gated community of Chabil Mar consists of luxury villas clustered and named after Mayan ruin sites: Altun Ha, Carcacol, El Pilar, Lubantuun, and Santa Rita. Each villa’s modern structure is complemented by interiors that exhibit Belizean and Mexican craftsmanship and creativity through ingenious display of native woods, furniture, and art. Each of the one- or two-bedroom homes face the Caribbean Sea, has its own balcony, and has direct access to the estate’s own beach. There are also two infinity pools. Chabil Mar’s exclusive setting gives its residents their desired security and privacy, but its proximity to the more developed and tourist-inclined Placencia also provides alternative forms of recreation. Chabil Mar’s owners, mostly Americans, Britons and Canadians, have the option to use their villas as second homes or rent them out to vacationers. All the units have been purchased but some owners are open to resale. Despite small injections of modernity, village life still characterizes Dangriga, a large coastal town whose population consists mostly of Garinagu. Clapboard stilt houses and community schools with vegetable gardens face dirt roads. A few Victorian buildings survive. There are also a Garifuna museum, a few good restaurants, and an unpaved airstrip. There is electricity, but airconditioning is too extravagant for locals, who prefer to go out on their porches when temperature gets too hot. Small-scale crop and citrus farming is not only an economic venture but a social activity as well. What locals can’t produce they get from the stores. Hopkins Village is a small fishing community where its main residents, the Garinagu, faithfully practice their culture and pass it on to their children. There is a Garifuna drumming centre where boys are taught the drumbeats that accompany traditional songs, dances, plays, and religious rituals. Their unique language is also kept alive not only through conversations but through poetry and storytelling as well. Houses in the village have thatch roofing, dirt floors, and brightly painted concrete walls. Residents have the luxury of cable TV but many still prefer to chat with their neighbours outside. Travel by foot or bicycle is common. The village has several schools, small clinics, dry goods stores, and fresh produce stalls. In recent years real estate developers have seen Hopkins Village’s residential tourism potential. The place has virtually no reports of crimes. Trips to the Belize Barrier Reef, declared a UNESCO World Heritage Site in 1996, are also quicker from here than from Placencia. Improved roads have made the beaches more accessible, and lots have been turned into hotels and resorts. Houses and condominiums here target expatriates. Property prices are lower here than in Placencia. Sittee Point Estate near Hopkins Village is a private residential community offering 59 oceanfront and ocean-view lots. A few have been sold and about three homes are already constructed. Owners have the option to build their own approved designs or choose from models such as the Jabiru, a three-storey, four-bedroom villa. What attracts investors to Sittee Point is the dense mangrove forest nestled within the estate and the advertisers’ promise that it will be preserved. This once comprised about 80% of the total area, but now it seems that it is down to about 70% as more lots are added. The private acquisition of the land was controversial, as the government seemed to hasten the process of title transfer at the time when studies of its protective value against natural adversities were ongoing. There have been dialogues involving local residents as to the fate of those important mangroves.